I had lunch with my dear friend, Cathy Taylor, this past Tuesday. As we do so often, we met at Cristiano’s in Marysville. Usually we meet on Wednesdays, because Wednesday is Tomato Basil soup day, and Cristiano’s has the best tomato soup you will ever have. But this week, Tuesday was the only open day, and we really couldn’t put our lunch date off. We’re going to France next month to teach the European Calvary Chapel Pastors’ Wives retreat and we needed to finalize which of us would be teaching what. 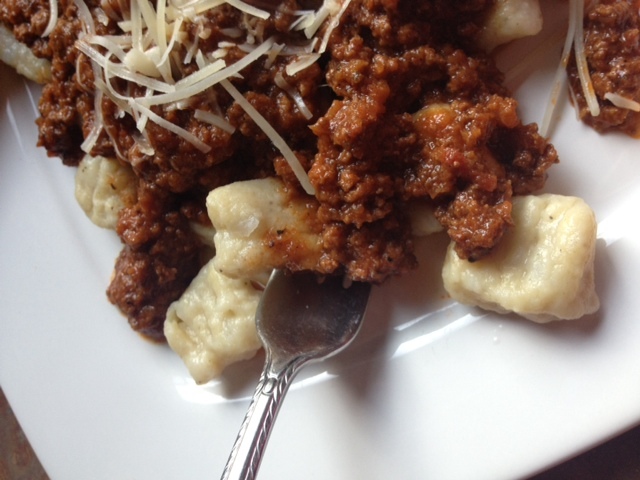 I’m very glad our meeting was forced to a Tuesday, because had we met on our favorite day, we would have ordered our favorite soup, and we would have missed out on Cristiano’s amazing new item: Gnocchi with Bolognese Sauce. They described it so beautifully on their chalkboard menu that we both ended up ordering it, and that was a good thing. Our 3-hour lunch was wonderful. We talked through our retreat, current ministry challenges, the joys of grandmotherhood, and all the news we’d been saving for a face-to-face. (Have I mentioned how much I adore Cathy? Gift. She is a gift to me.) When we finally left our table, I brought with me half of my lunch and a determination that I would be making a gigantic batch of both gnocchi and bolognese sauce this week. The gnocchi is in the freezer. The bolognese sauce is cooling on the stove. When I have better natural lighting, I’ll allow myself a plateful. I never dreamed I’d be one to plan all my meals around which lighting was most conducive to picture-taking, but there you have it. While I would love to call this a “quick weeknight meal,” that would be a giant whopper. This is a recipe to try on a day when you have time to don an apron, and put on music you love, and think about how much you adore your family. It’s to save for a day when you don’t mind entering full-body into a labor of love. Because that’s what this is … and it is worth the labor. To start, chop the vegetables as finely as you can to make a soffritto, which is the combination of onions, carrots and celery in a 2:1:1 ratio. Heat the olive oil and butter in a large pot and cook the soffritto over low heat for five minutes. Salt the vegetables as you are cooking and stirring. Add the chopped pancetta (or bacon) and minced garlic. Continue cooking for another 10 minutes or until the vegetables are beginning to brown. Don't worry about little brown bits in the bottom of the pan -- you want those brown bits. That's where all the flavor develops. Just use the edge of a spatula to scrape it off occasionally and stir it back into the vegetables. Slowly add half the ground beef and ground pork to the pan, breaking the meat up as you go. Don't be in a rush to add the meat -- let the first half cook down a little before you add the second half. You're trying to evaporate the moisture from the meat, and if you add it all at once, you end up boiling the meat instead of browning it. I have a round metal "chopper" that I use to continually chop the meat as it cooks, but you can get the same effect using your spoon or spatula. Just keep chopping through the meat until it breaks down into very small pieces. When all the meat has been incorporated into the vegetables and browned, slowly add the milk to deglaze the pan and coat the meat. Using your spatula to release all the brown bits from the bottom of the pan. Adding the milk at this stage tenderizes the meat and somehow coats and protects it from the acidity of the tomatoes you'll add in a minute. When the milk has deglazed the pan, slowly add the wine and cook five minutes, stirring well. Add the beef broth and stir. Add the tomato paste and 28 oz can of tomatoes. If the tomatoes are whole, cut them with the spatula and you're stirring the mixture. To cut the acidity of the tomatoes, you need a little sugar. I don't like to add granulated sugar, but one spoonful of grape or berry jam works just as well. Stir that in now. Leaving the pot uncovered or just half-covered (so steam can escape), cook the bolognese for 3 - 3 1/2 hours, stirring often to make sure the mixture doesn't stick to the bottom of the pot. This long cooking time isn't optional, because it's the only way to let the flavors develop. About a half an hour before you want to serve it, add the grated parmesan and stir well. If oil develops at the top of the pot, just stir it back in. At the very end of the cooking time, if you want to spoon that off, you can. After refrigeration it will be easy to remove the excess oil if you want to wait for that. You can serve this the day you make it, but it really shines if you let if rest in the fridge for a day before serving. I like to make a double-batch and freeze half for another meal. Be sure to serve with more grated parmesan! *Note: This is a meat-based sauce, not a tomato-based sauce, so don't give in to the temptation to add more tomatoes as you're cooking it. The end result should be meaty and creamy, but not tomato-y. Authentic bolognese uses white wine, which might go against your wine sensibilities. Typically, you use red wine with beef. But in this recipe, red wine would be overpowering. Also, you may notice there isn't much here in the way of herbs and spices. That's because classic bolognese doesn't include these. Taste it after the first hour to see if you like it this way, and at that point if you want to add some thyme or Italian seasoning, add it then. … and garlic bread sticks, of course. Dave, on the other hand, is a pasta purist. Spaghetti only. But there’s no law against pasta hybridizing. Just in case you want to see how finely I chopped the soffritto, here’s what it looked like while browning. And here’s perhaps the best picture of all: a second batch for my freezer. Happy, happy, happy. Looks like my kind of bowl of goodness…will cook both is these this week!